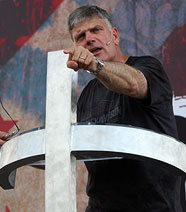 Franklin conducted his first evangelistic event in 1989 and now conducts Franklin Graham Festivals around the world for the Billy Graham Evangelistic Association (BGEA). He has proclaimed the Gospel message at 184 evangelistic festivals in 37 states and 49 countries since 1989. In 2016, Franklin launched the Decision America Tour and traveled to all 50 state capitals to hold prayer rallies. The focus of these rallies was to challenge Christians to pray for the United States and its leaders, and to live and promote Biblical principles at home, in public and at the ballot box. The Decision America Tour is continued in 2017 in Tennessee and Texas and again this year with 17 stops in California, Oregon and Washington. Franklin and his wife, Jane, have four children, Will, Roy, Edward and Cissie, and 11 grandchildren.